Here is everything you need to know about this fun, beautiful, and functional nursery designed by Catherine-Lucie Horber. BDMS: What were your clients' needs for this space? Horber: The clients' needs were to first and foremost, make a drastic change to the space and make it bright and cheerful! It had to be a happy place. Horber: The main challenge in this space was the size of it. Being a very small room, layout was a bit limited. Making the best of it and still providing a feeling of spaciousness and wow factor was challenging. But we succeeded with a multitude of interesting glam elements, such as the wainscotting around the room, a wall paper accent wall, custom silk drapery panels, etc. 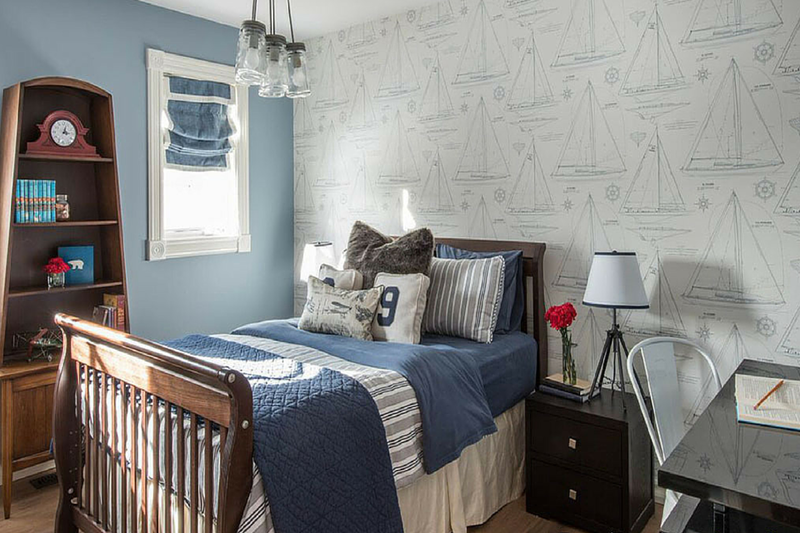 BDMS: Do you have any special considerations or requirements when designing a kid's room? Horber: My main consideration when creating children's rooms and any room for that matter is longevity. I am a firm believer in longevity being the key to any successful design. I always try to have the majority of the elements be long lasting in style and color and usually have fun with smaller items like drapery, cushions, artwork, wall color, and accessories - things that can be changed easily with time or adjusted to evolve with the children, but the main pieces remain solid. In this case even the nursing chair is not your typical one, it is a beautiful accent chair that can be used in any bedroom as a reading corner. Horber: What makes this room functional is the layout, from where the crib placement is to where the changing table is to the open closet organizer, storage, baskets, 2 full dressers - it is easy to maneuver around it while still allowing a nice open area for the child to play. Horber: The main inspiration of the room was derived from our star fabric, the deep teal and coral damask fabric that was used for the bed skirt. From there, we selected many other softer shades and found the perfect wall paper accent and honeycomb silk fabric for the drapes. Horber: There are many things I love in this room, overall I'd say the whimsical happy, cheerful vibe the space evokes. I also love a few of my favorite indulgences we were able to enjoy, things like the wainscotting all around the room, wall paper feature, full wall of silk drapes, fun accessories with crystal, silvers, glam and chic. The beautiful feminine curves of the nursing chair in a beautiful soft sea foam color embellished with beautiful silver nail heads all around truly all help making this space a special one. Horber: What the clients said they liked the most was that it was a space they could enjoy spending time in and relax in. They also said it was their baby's favorite room in the house… which must say a thing or two about stimulating a young ones' senses.